The National Fire Protection Association recommends that smoke alarms be installed inside each bedroom, and outside each sleeping area. The first week of October is Fire Prevention Week – a national informational event established to commemorate the Great Chicago Fire of 1871. Since 1920, the United States Presidents have encouraged the nation to take this week to learn about fire safety and prevention. So how can you make sure your apartment is ready in case of a fire? Here are some tips that can help in case of a fire. This year, Fire Prevention Week is focused on smoke alarms in bedrooms. Their message is “Here the Beep Where You Sleep” – that every bedroom should have its own smoke alarm, and that these alarms should be tested monthly. The National Fire Protection Association recommends that smoke alarms be installed inside each bedroom, and outside each sleeping area. 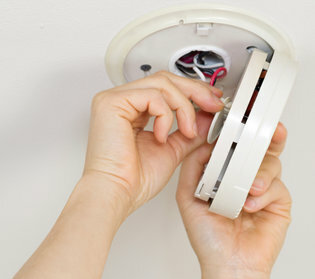 Remember, never paint smoke alarms, as paint, stickers, or other decorations can keep the alarms from working properly. If you suspect a fire in your apartment building, proceed with caution. Before you leave your apartment, check the temperature of your door. If it is hot, the fire may be close by – use another way out. If the door is cool, leave by the nearest exit. If you run into smoke, move to the floor. Smoke rises, so the cleanest air is near the floor. Crawl on your hands and knees in order to keep your head below the smoke. If you can’t escape your apartment, stuff wet towel, sheets, or clothes around the door and vents to keep smoke out. Call the fire department and tell them where you are. Be as detailed as possible to help fire fighters find your location. Under no circumstances should you go back into the building. Have a bag of essential paperwork and necessities in a place that you can quickly grab them on the way out. If you think someone might be trapped inside the building, tell the fire department immediately. This entry was posted on Tuesday, October 20th, 2015	at 8:32 pm	. Both comments and pings are currently closed.